Recently I spent a week at the beach with my children and grandchildren. They love to hear my stories and ballads and asked to hear favorites every day. 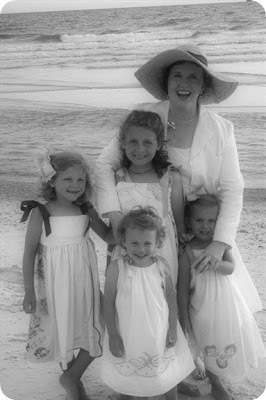 I come from a long line of storytellers and can anticipate the request of each one–little four-year old Anita wants princesses because she imagines she is one; for Jane, at six, exciting stories of adventures, battles and horses and scary beasts are perfect; Jessie and Izalou, at age two, are happy with attention from Grandmommy. Every night at bedtime, their sleepy eyes expectantly searched my face as I told them all their favorites, along with my own favorites--stories about when I was little, growing up in the rugged mountains of Virginia. Ballads and hymns taught me by my mother, passed on from hers, sang them to sleep. My husband and I had brought stacks of books with us for further research on the settlement of Jamestown in preparation for our participation in Vision Forum’s celebration of the event two weeks later. As we read the rich history of all that occurred during those early years, much of it from first-hand narratives, and began sharing incredible accounts of God’s hand of providence with our children and grandchildren, a picture emerged to me of a grandfather reliving with his grandchild events through which he had struggled: I had found the “voice” I had prayed for to tell these remarkable stories of our nation’s beginnings. The realization that this voice was a strong one from my childhood gradually dawned on me as the grandfather in the poem began to take on flesh and blood through his stories. The voice wasn’t vague but was one that is forever enshrined in my heart: the voice of my own story-telling grandfather. How can the scope of the drama of Jamestown be conveyed in mere words? The bravery and horrors, the battles and intrigue, the romance, ingenuity and tragedy that played out on the stage of history, both in England and Virginia; while overarching and under-girding each scene the mighty hand of Providence worked through the perseverance of men. How could this grand history be recounted so as to engage the minds of the young and capture the consciences of those caught unaware of history’s power to inspire? It helps to have been bathed in a stream of epic tales since childhood as I was, virtually breathing in with the crisp mountain air a reverence for the land, sinful man’s losses and righteous men’s crosses, the poignancy, passion, and final redemption or damnation all men face. My grandfather often quoted from Longfellow, Life is real! Life is earnest! And the grave is not its goal. ‘Dust thou art, to dust returnest’ was not spoken of the soul, (from A Psalm of Life, by Henry Wadsworth Longfellow). My grandfather was small of stature, but I never knew that until I saw pictures of him when I was grown up. Maybe the reason he seemed bigger than life to me was because of the gargantuan stories he read and told me when I was a little girl–-I was riveted by selections he chose from La Chanson de Roland, Beowulf, Sir Gawain and the Green Knight, Spencer’s Faerie Queen, Milton’s Paradise Lost, and Chaucer’s Canterbury Tales. A former schoolteacher turned Presbyterian preacher, he showered me with a plethora of stories from history and literature. On Sundays after Granny’s home-cooked lunch, he’d quiz us on Bible trivia and check up on our memorization (and comprehension) of the Westminster Shorter Catechism. Of course, we read the Bible--the book of Job was our favorite to read aloud because of its majestic, poetic descriptions of God’s creation and its happy ending! I delighted to hear him read or quote poems by Henry Wadsworth Longfellow, Alfred, Lord Tennyson, William Wordsworth, Sir Walter Scott, Robert Louis Stevenson, Robert Service, and Rudyard Kipling, to name a few favorites. This rich heritage is better far to me than chests of gold! 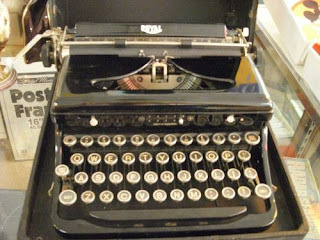 The clank of the old Royal typewriter keys as Grandpa carefully prepared his sermons each week and the pungent smell of the mimeograph ink mingled with the scent of the dust of the decades clinging to his old books will forever remain in my memory. He let me help make the Sunday bulletin on Saturdays in the summer. The heat of that cramped, third-story office in the manse intensified the sounds and smells that seemed to seep into my pores, enveloping me like a mantle. I never felt that I was interfering; rather, as he talked and listened to me, always giving me real work to do, no matter how small the job, we became a team. I was helping my grandfather and I was content. Gradually and steadily, under his wise and loving tutelage, together with that of my parents, theologically, morally and historically, I formed a solid personal identity and found a foothold in the rapidly moving current of history. This firm foundation is the bedrock, the base upon which I have built my life and it is broad and strong enough to hold future generations. I adored my grandfather--we were “kindred spirits”; and I loved my Grandpa’s dad. Great-Grandpa Charles had a snowy beard and hair that curled in soft clouds around his gentle face. He always carried peppermints in his pockets for his grandchildren and often entertained us with little songs or stories. One evening, when just a hint of frost was in the air, he sat rocking on the back porch where the nearby Golden Delicious apple tree spilled its juicy treasures for our eager mouths. The shadows made by the trees as the sun set behind the craggy cliffs across the little river a few hundred yards away were creeping across the lawn. I munched my apple and decided to try to make conversation. “Gonna be gettin’ cold soon, Great-Grandpa,” I ventured. “Want me to fetch your shawl?” When he didn’t answer, I got up from my seat on the painted porch floor where I’d been dangling my legs, enjoying the peace of the quiet Sabbath afternoon and touched his arm. “Great-grandpa, did you hear me?” His head was bowed onto his chest and his whittling knife slipped soundlessly to the floor a-top curled shavings from the toy he had started for me. On the backside of the blade, I could see the worn place his thumb had made. It was our last moment together: Hush’d is the harp: the Minstrel gone, (from The Lay of the Last Minstrel, by Sir Walter Scott). I was seven years old and thought it was tragic that my great-grandpa had died so suddenly and alone. But now, more than fifty years later, my perspective has broadened. I am a grandparent, six times over, so far. I have five “born” grandchildren and one due early next year. I pray that I may live to a ripe old age and see them become strong, Christian warriors as my children, their parents have grown up to become. But I have come to realize that there was a blessing attached to my kind great-grandfather peacefully passing on to glory as he watched me happily swinging my short legs out into the future. The length of our days holds much less importance than the heritage we leave our children who will either bless or curse our memory. 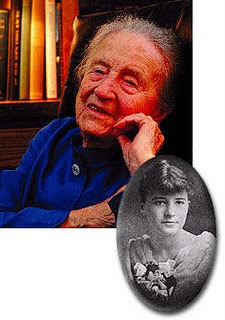 A long life can be one of misery if fraught with bitterness and discontentment from a rebellious heart; while a life dedicated to the glory of God and trusting in Providence, even though it may be short, will be a blessed one through submission to God’s sovereign hand and faithfulness to His revealed will in Scripture. As we read history with a Christian mind, these parallel truths stand out in bas-relief. Belief in God’s sovereign purposes accompanied by daily discipline and devotion to duty kept the fear of death at bay for my grandparents and many of the original settlers. Arms become steeled for battle when such a belief is strongly held and life-altering decisions become plain, if not always easy to make. For a man, woman or child devoted to duty, as it is prope rly understood, death is not the greatest enemy. 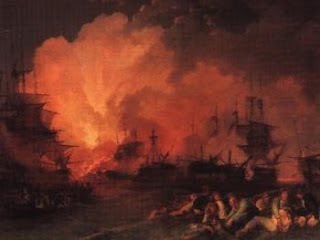 Are we not stirred to perseverance by the boy, who, faithful to his father’s orders, stayed at his post on a burning ship? “The boy stood on the burning deck, whence all but him had fled…,” (from Casabianca, by Felicia Hemans). My own son, John Calvin, memorized this poem from his McGuffey Reader, as did my grandfather almost a century before him! Courage and faithfulness were stamped on the consciences of generations of brave men and women who inspired their children and grandchildren to embrace heroism and virtue, not only through their own daily examples, but also through the tools of Scripture, true tales from history, stirring poetry, music that inspires the heart and great literature. Our current age and culture, in large part, seems to have cast these standards off as outdated sentimentalism. 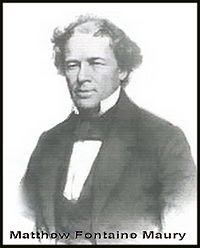 Such a faithful man was Matthew Maury of Virginia, who in a letter to the Grand Admiral of Russia in the mid-1800’s, declining his invitation to continue his studies in oceanography at St. Petersburg, gave his reasons: I am contending, as the fathers of the Republic did, for the right of self-government, and those very principles for the maintenance of which Washington fought, when this, his native state, was a colony of Great Britain. The path of duty and honor is therefore plain, (from Library of Southern Literature, VIII, pp. 3453-3454, quoted by Richard M. Weaver in, The Southern Tradition at Bay, p. 169). My great-grandparents, Charles and Sarah (Raines) Anderson, blessed us with my wonderful grandfather, their son, Elihu Hiram Anderson, faithful minister of the Gospel, educator, storyteller, balladeer and godly example. I am grateful for the legacy of his sterling character, his love for the Lord, the testimony of his life’s diligent work, and for the stories, poems and songs he passed on to both my mother and me, as well as hundreds of friends, students and parishioners who were privileged to know him. I could never adequately thank my unforgettable grandmother, “Granny Anne,” Anne (Fuller) Anderson, his wife, who was everything a grandmother should be; nor her daughter, my mother’s sister, my Aunt Virginia Belle, who taught me to read in a little two-room wooden school house on Prater Creek. I loved cuddling in her lap as a very little girl and hearing her gentle voice read poems as steam from her cup of tea made sweet-smelling curls in the air. My mother was delighted to hear of the poem project I had undertaken for our state and nation’s 400th birthday. I watched excitedly as she turned the pages, reading each line for the first time as familiarly as if she’d written it herself. Suddenly she stopped and said, “Honey, I’ve heard about these events before.” Her china blue eyes opened wider and she snapped her fingers–“I know where!” she exclaimed and raced back to her bedroom to return with an antique book across whose faded cover I could barely make out the title: To Have and to Hold, by Mary Johnston, an up-dated copy of which I had just read during the week at the beach because of the history of the settlement of Jamestown it contains. “My dad, your grandpa, read this book over and over and had practically memorized it. He told it to me from memory as we walked to school together when I was just a small child. It was one of our favorites.” My mother had often told me how she stayed beside him from the time she was a toddler, following after him at his chores, listening to his songs and stories, begging for more as they walked together several miles each day, to and from the little mountain school where he taught his own and local children. Even though my mother had heard this story about the settlement of Jamestown more than seventy years ago from her father, it had left a lasting impression on her. Again I realized that my own grandfather was indeed the model for the one in my poem. He passed on to my mother, not only the history of Jamestown’s settlement through Mary Johnston’s wonderful book, (who’d gleaned many historical facts from her father, Major John Johnston, CSA, and her cousin, General Joseph Johnston, CSA); but he continually inculcated in her a love for great literature and true history, along with a love for beautiful words and songs and ballads, all sifted through the grid of Biblical truth which retains only that which is true, honorable, right, pure, lovely, of good repute, excellent, and worthy of praise..., from Phillipians 4:8. My mother, persevering at her post, has joyfully instilled a vital appreciation of this legacy in all of her children. How can I find adequate words to thank you for making my heritage a treasure to me, dearest of all mothers, Anita (Anderson) Belcher? Not only have you passed on the legacy left to you, but you have added to the rich mixture your own wonderful writing-–your poems, songs and stories, as well as scores of family histories procured through interviews for our county newspaper for over thirty years. You still share all of these, through God’s blessing on your long life, with your (soon-to-be) thirteen great-grandchildren. They just as eagerly gather at your feet as we, your children and grandchildren do, we who rise up and bless you. We stand in awe at your ability to make every moment of life a treasure, though tempted and tried and oft made to wonder, (from an old mountain hymn, Farther Along). Days spent with you are strung like pearls on a string and worn as a prize around our necks. All who know you are encouraged to faithfulness and blessed by your godly wisdom and example. “[S]he has learned much who knows the pain of struggle,” (Mult ad apris ki bien conuist ahan, -–La Chanson de Roland, Stanza CLXXXIV, line 2524). You are my role-model, the greatest woman I know; in large part because you give all glory to God and humbly see yourself standing as a sentinel on the land where God planted you, guarding the heritage left you as a sacred trust. And you love the land attached to our history. People who give up their own land too readily need careful weighing, exactly as do those who are so with their convictions. I am …sure that one of the deepest mysteries, one of the great, as it were, natural beauties of the heart, …lie[s] in one’s love for his own land, (from an essay by Stark Young, quoted by Richard Weaver in The Southern Essays of Richard Weaver, p. 22). 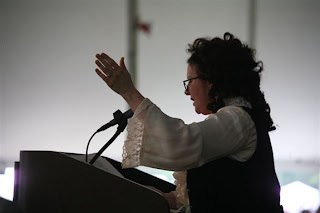 Our land has always been important to my mother and father, as it was to the settlers at Jamestown; for it represents, not only a connection with the past, but is a sign of God’s covenantal blessings on the future of a man and his family. God’s blessings on His people were always tied to a “promised land.” In Deuteronomy 1:8, God spoke to Moses, commanding him: Behold, I have set the land before you: go in and possess that land which the LORD sware unto your fathers, Abraham, Isaac, and Jacob, to give unto them and unto their seed after them, (The Geneva Bible, 1599, Tolle Lege Press edition, 2006). Thank you, “Papa C.,” Clynard C. Belcher, for keeping the land my mother inherited as well as the land given you by your mother and father, Marion Calvin and Una (Puckett) Belcher. No place on earth do I love more sincerely…, (from Virginia’s state song). We are grateful beyond measure to you for defending our land and liberty during World War II, where you fought in Europe in the 3rd Battalion Headquarters, 70th Division of General “Blood and Guts” Patton’s Army, “The Trailblazers.” We are proud of your courage, Papa, and grateful for the stand you took when our freedoms were threatened, even giving up the opportunity for a college education to enlist at eighteen. I love remembering your wonderful tales of when you were a boy as we were growing up; and your singing us to sleep at night with your deep bass voice and guitar, painting cowboys and yellow roses on the walls of our minds, –RBM. As we snuggled under quilts our Granny Anne had made, you tucked us in tightly with the warmth of your love and protection. Thank you for sharing your faith with us from the time we were babies and for reading from God’s Word to us, without fail, every morning and evening of our lives as we were growing up. Humbly thanking God for the blessings our heritage rendered, you constantly encourage your family--four generations so far-–to be a thankful people, as we gather in the shade of the tall trees you planted as saplings when we were babies. Thank you, Mama and Papa, for guarding the candle of faith and keeping the wick well-trimmed, from Candle of Faith, on the recording, Arise! Shine! by Judy (Belcher) Rogers. And thank you for reaching out beyond our family to those lost in darkness, whether a biker who stops by your house in the “gap” at the top of your steep mountain for a drink of cold water, or those families whose needs you have met through your prayerful, “hands-on” evangelistic efforts throughout your lives to the present day, helping to establish at least four mission churches in our county. You turned down several promotions, Papa, in order to stay where God had planted you; and, together with Mama, you continue to minister to those God places around you. …Godliness is great riches, …if we first seeke the kindgome of God, al other thinges will be given unto us, and that as the light accompanieth the Sunne and the heate the fire, so lasting riches do wait upon them that are jealous for the advancement of the Kingdome of Christ, and the enlargement of his glorious Gospell: As it is sayd, I will honour them that honour mee…, (Richard Hakluyt, quoted in The American Dream, by Stephen McDowell and Mark Beliles, p. 45). We were planted here on Virginia soil over ten generations ago. Our familee overspreads land that has been in our family throughout its long history. This is sacred ground to me, solid as the everlasting hills, my terra firma. My prayer for our children and theirs, “…children yet to be born,” (Psalm 78:5-7), is that we will continue to dedicate ourselves and our families to passing down the candle of faith through the generations. And not some vague faith in an ephemeral “god” of our own making who is disinterested in his creation; rather, we must hold fast the treasure of a strong and vibrant faith in the God Who really exists, Who thunders from Heaven and Who has spoken in His Word and through His only Son, the Lord Jesus Christ, the King of men and Lord of history. We must be careful to instruct our children in the “doctrines of our holy religion,” as we have vowed to do. Otherwise, the faith of their fathers will devolve into an empty spiritualism that is void of truth and therefore ineffectual. Ours must be an informed and passionate faith in a covenantal God that is carefully guarded and yet held aloft to light the paths of those who would otherwise walk in personal, familial and cultural darkness. The flame of faith will be fed by “war stories” from our lives and the lives of those throughout history who have stayed at their appointed posts, regardless of the cost, such as those men who, one-hundred and sixty-nine years after the settlement of Jamestown, declared our independence from England: …for the support of this Declaration, with a firm reliance on the protection of divine Providence, we mutually pledge to each other our Lives, our Fortunes and our sacred Honor, (from The Declaration of Independence). Steadfast commitment to duty, to Christ and to the welfare of future generations marked true heroes and heroines of America’s great past. When we tell their stories to our children, these heroes still speak through us as their history ‘comes to life’ through our words. With all my heart, I pray that I have achieved something akin to this goal through my humble and inadequate tribute to the persevering men and women who “dug our roots in deeply” at Jamestown. Along with great stories from history that illustrate God’s providential dealings, tell your own stories of God’s hand in your life and in current events. My own dear children and nieces and nephews, (whom I love like my own children), in the midst of your productive lives, don’t forget to leave time to sit out on the porch, singing the moon up, telling your children and grandchildren stories about when you were little...,–RBM (from the preface to my book of poems, Roots and Vines). Remember God’s providence in history as you tell the great stories you have learned, look for it in your own lives, and by His grace, persevere! Thank you, my precious children and your godly spouses, (I still want to be like you when I grow up), Anne Elizabeth and Dr. Grant Jones Scarborough; Joey (Joseph Charles, IV) and Jennifer (Pabsch) Morecraft; John Calvin and Kim (Pepper) Morecraft, and Mercy Rebecca Frances Morecraft ________? ; thank you for sitting still and listening to all those stories and books and songs when you were little and for passing them on now to our grandchildren, our darlings Jane Elizabeth, Anita Katherine and Jessica Lucille (Jessie) Scarborough; John and Kim’s precious Izalou Sutton Morecraft and your new-born brother, Asa Raines Morecraft; as well as baby Joseph Charles Morecraft, V, (Charlie), by God’s abundant grace making an appearance in history in February, 2008! Our grandchildren already love hearing the stories and songs we’re passing on to them. On a recent visit, our oldest granddaughter, Jane, (who is named for a dear friend and descendant of Pocahontas, Jane Brown, as well as for Lady Jane Grey, courageous queen of England for nine days), absolutely fell in love with John Smith. After hearing his stories from us for four days, she borrowed my camera and took photos of a book cover with his face on it to carry home with her and post on her bedroom wall! Think of that: not a cultural idol, but John Smith! I pray that my grandchildren will reverence these treasures and tell my great-grandchildren the stories and songs they’ve learned from Granddaddy and me--the ones we learned from our great-grandparents and parents and from great, reliable books--in a way that will engage the hearts and minds of our future generations and cause them to love their godly heritage: Oh, Lord, may Your favor rest upon us – show your glory to our children, (from, Psalm 90, on the recording, Never Be Shaken, by Judy (Belcher) Rogers). 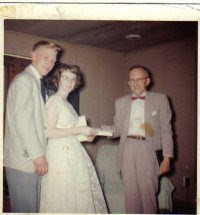 In God’s perfect timing and by His gracious providence, the man who was to become my husband came to our tiny mountain hamlet in Virginia to live with my grandparents the summer I turned fifteen. He came to assist my grandfather, whose health was failing, in his ministry at Dickinson First Presbyterian Church. Now, for over forty years, God has blessed my appreciation of great books, my love for history, and a vision for the expansion of His glorious kingdom to grow daily through the faithful teaching, preaching and consistent example in godliness of this mountain of a West Virginian, my beloved husband, Dr. Joseph Charles Morecraft, III. His patience with me is unparalleled, except perhaps by Job himself. Thank you, my dear Mentor and personal Prophet, for your immense thoughts and practical suggestions; thank you for crying and laughing and living history with me. Thank you, precious Mercy, our laatlammetjie (Afrikaans for ‘late spring lamb’ and pronounced, laht-lahm-uh-kee), not only for filling in for me all these weeks--for cheerfully and skillfully shopping, cooking, cleaning, and so much more; but most importantly, for being a shining star in the lives of all you touch. (For you will shine like stars in a crooked and perverse generation, Phil. 2:15, sung by Judy Rogers on a recording). Thank you for esteeming and loving your mommy and daddy and submitting, in the major as well as the minor, to your father’s will with a glad heart. I am especially grateful to you just for putting up with the umpteenth “final version” of this poem for months, as well as applauding a little too loudly when I was really finished (stop laughing–-you’re right—I haven’t “abandoned” it yet!). I gratefully acknowledge the incomparable assistance, inspiration and support I continually receive from my best friend and sister, poetess, songwriter and singer, Judy Rogers, (www.judyrogers.com), my ‘meter maid,’ and her long-suffering husband and faithful pastor, Wayne, a.k.a., ‘Robert E. Lee,’ Rogers, (www.sermonaudio.com/calvin1509); as well as invaluable suggestions from my faithful friend, Gail Pinckney Moore, college roommate, superior educator, wife of a true hero, Lt. Colonel E. Ray Moore, (www.exodusmandate.org), and life-long pal. Thank you more than mere words can convey for your prayers, help and encouragement. Especially I thank Zemmie and Enoch Fleck, for your patience and technical assistance during the ‘trial runs,’ making copies ad infinitum. I am deeply grateful to my kind writing friends who, through their suggestions have helped make my original, very rough drafts, if not quite a silk purse, at least a much more presentable ‘sow’s ear.’ Thank you sincerely for your many readings and comments, Judy Rogers, Gail Moore, Carmen Friedrich, Susan Burns, Ina Painter and Jennie Chancey. Without consultation, plans are frustrated, but with many counselors they succeed, Proverbs 15:22. God is good. May He receive all the glory from this work of love, attempted originally for our dear friend and esteemed brother, Douglas Winston Phillips, Esq., a warrior for King Jesus, of whom the world is not worthy. We consider it no small honor to engage the enemy on the battlefield of this world alongside you. I pray that God will be pleased to wield His mighty sword in the defeat of His enemies in our children’s lifetime. May this tribute to our founding fathers at Jamestown be a tool that God will use in the struggles in which we are engaged; not physical battles such as the settlers at Jamestown waged against flesh and blood, but against our deadliest foe, the spiritual evil that darkens men’s minds--materialism, lethargy, error and intellectual arrogance. May God be praised as we raise Christ’s victory banners aloft in our brief moment of time, passing them along with the candle of faith, down through generations of children who, by grace alone, will love their heritage and gratefully praise the God of all ages Who gave it to them. Dr. Denmark has reached another milestone in her long life -- she is now 112 years old. Although her life has spanned parts of three centuries, it is not merely the length but the quality of her life that is remarkable. Scroll down to 'blog archives' and choose February 2009 to read the post I put up last year about this time and praise God with me for this remarkable woman.